"Strong with perfect construction. Full of flavor." "Nother day at the office:))"
AJ Fernandez Bellas Artes features a "Rojita" wrapper, a hybrid tobacco grown in Nicaragua, with a Nicaraguan Habano binder and fillers from Brazil, Honduras and Nicaragua. Rojita tobacco was created by crossing US Connecticut, Corojo and Havana 2000 seeds. This delicious medium to full bodied cigar is well made, with spicy and nutty flavors throughout the profile. Have you ever wanted to try AJ Fernandez’s fine line of cigars? Well, here’s your chance to try five of their best cigars in one sampler and get a great cigar cutter too. The 5-Cigar Sampler includes: one each Ramon Allones torpedo (6”1/2*54), Ramon Allones robusto (5”1/2*50), Enclave broadleaf belicoso (6”*56) , Enclave Churchill (7”*50), Belles Artes Robusto Extra (5”*50), and a double guillotine stainless steel cutter. This incredibly tasty sampler by AJ Fernandez comes packed in a Humi-Pak for maximum freshness--no humidor necessary! You are getting one of each of these cigars: New World Puro Especial Toro; San Lotano Requiem Toro, Bellas Artes Toro; Enclave Toro; and San Lotano The Bull Toro. This pack saves you 33% on these cigars! Anonymous If i order a box can i get an autograph on it ? NeptuneCigar.com Hi! Whose autograph are you interested in having on your box? Anonymous Hi does anyone at neptunes have an idea on the flavours this particular stick puts out?? NeptuneCigar.com This cigar is described as having a spicy, nutty profile. Anonymous Do you offer free shipping with this sampler? 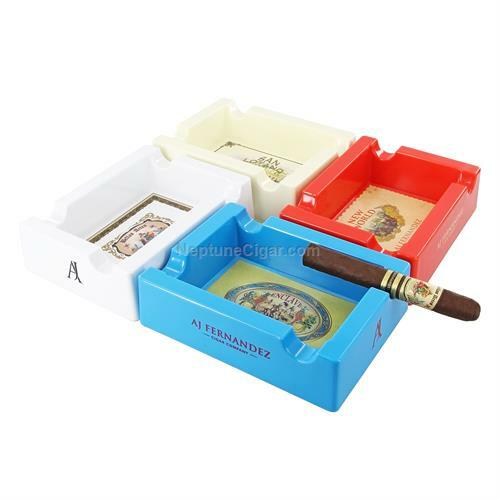 NeptuneCigar.com This sampler does not qualify for free shipping, but we are offering free shipping for orders of $99 or more at this time. Normally a AJ-fan but this cigar was bit of a disappointment to me. No changes whatsoever during the smoke time. Excellent smoke with a very thin wrapper. Needs to be well humidified to avoid unraveling. An outstanding sampler for the money!! Reasonably priced smoke. Good value, good flavor. This has got to be the best AJF sampler out there with an awesome price point and you they throw in a cutter to boot. Another good stuff by AJ! Another great AJ blend with coffee and spice. Great construction. Great value and great cigars. AJ is amazing at crafting quality sticks. AJ has become my favorite cigar maker. Elegance, flavorful, and very fine tasting cigars. The cigars in this sampler are just amazing. For what you get the price is almost too low. Great for beginners or aficionados alike, AJ Fernandez will never disappoint. Bit of a bite to start but smoothed out. Well Constructed Cigar. A true lily beautiful work of art! Amazing cigar , amazing price ! Very unique and pleasant flavors. B- This cigar has a nice burn and good draw. Just a little to much bite for me. taste was a little blah. I think that the Bella's artes cigar was excellent good taste, draw, good burn. I would definitely recommend this cigar to anyone! This is an awesome pack of cigars. I thoroughly enjoyed every one of them and believe it has made me a definite AJ fan. To top it all off the come in an cool humidor bag so just buy one to take on the long weekend break. Perfect. Great taste wrapper, square burn all the way up cigar, about 8 on strength. smoke aplenty, wrapper has AJ name on back of label so you know who made it. Wife said smoke was nice smelling. There was slight damage to the wrapper when I received my order. Cigar was enjoyable, not memorable. Nice variety at a good value. This pack let's you try 5 at one heck of a deal. Full bodied does not always equal full flavor. It wasnt bad by any means, just a bit flat. It may have needed more time in the humi. Talk about bang for your buck! Amazing sampler at an awesome price. It is a hard choice, but the enclave and habano are my favorite out of this package. This sampler is one of the best I've tried to date. By best I mean per price point and quality of the overall presentation of the cigars purchased. Additionally my order arrived earlier than expected, Neptune has become my go to (on line) shop. Great experience. UNA GRAN SELECCION DE ESTOS EXCELENTES TABACOS A UN EXCELENTE PRECIO, MUY BUENA CONSTRUCCION Y DELICIOSOS SABORES TOSTADOS EN ESPECIAL EL ENCLAVE. GOOD CIGAR. THE TASTE WAS OK. THE BURN WAS TUNELLED. I was immediately drawn to this cigar from the ornate cigar band. It reminded me of something I might have smoked if I was around 100 years ago. I will say that I was intrigued when I read that the wrapper used on this smoke was something called a hybrid wrapper. So I selected the short Churchill size which features a 48 ring gauge as I feel you can reallI sample the wrapper profile I lower gauge cigars. I really felt impressed with the overall construction of this cigar, it was very well made and firm with the wrapper being very smooth. After lighting I detected many initial flavors, while no one single flavor seemed to overpower the other. I definitely detected some citrus like flavors as well as black pepper but not quite as spicy as some cigars tend to be. As the cigar progressed I tasted a small amount of cedar. Towards the end of the stick the pepper profile increased slightly but not to the point of being overpowering. Throughout the cigar I also seemed to taste slight caramel too. Overall I would have to characterize this cigar as a slow burner that really takes it's time. I really was amazed by all of the flavors present and would most definitely smoke this again. Overall 6 out of 10 not one of my favorite AJ products.. a bit disappointed with the flavor. Great offering from AJ fernandez. Great cigar.A little stronger than the enclave. A J Fernández has better cigars. Nothing impressive. Great draw, taste, and burn. This is an awesome sampler. I looked all over and what a great price point. The Fernandez brand alone is worth it and the San Lotano oval is an awesome cigar. Throwing in the bag which really hooked me was a bonus.